The way businesses use SaaS applications, systems and services has changed dramatically; having a solid integration solution in place is crucial for enabling seamless connectivity. A couple weeks ago, we discussed the importance of choosing an iPaaS solution that fits your specific integration needs – not all businesses are created equally and what works for one organization may not work for another. Properly evaluating a solution can have a huge impact on the success of your business. 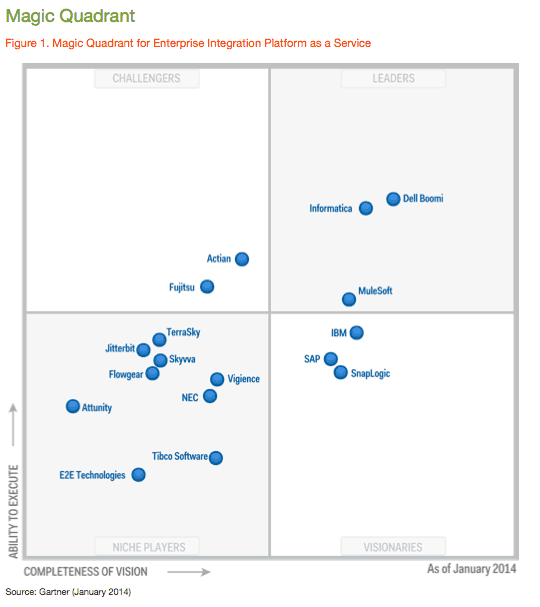 With that in mind we thought it would be a good idea to share Gartner’s 2013 Magic Quadrant for Enterprise Integration Platform as a Service. The report evaluates 17 separate vendors across numerous dimensions to help you choose the right cloud-based integration platform for your integration challenges. View the report to discover why MuleSoft is named a Leader! *This graphic was published by Gartner, Inc. as part of a larger research document and should be evaluated in the context of the entire document. The Gartner document is available upon request from MuleSoft.